The phrase "an apple a day keeps the doctor away" might sound more commercially appealing than "an apple a day keeps constipation at bay," but the latter is also true. Constipation occurs for a number of reasons, but an apple's fiber content can help to alleviate this gastrointestinal condition and allow you to have bowel movements with ease and regularity. Constipation is defined as the inability to have three or more bowel movements in a week. Several factors can lead to constipation, including a shortage of fiber in your diet, inadequate physical activity, dehydration and medical conditions such as irritable bowel syndrome. When you're constipated, you have difficulty having a bowel movement or you pass stools that are excessively hard. Straining for more than 10 minutes and being unable to have a bowel movement is a sign you're constipated. Consuming adequate fiber is a simple method of relieving constipation, and apples are ideal because of their high fiber content. Adults should consume around 30 grams of total dietary fiber per day, and one or two apples can quickly help you work toward achieving this goal. Always eat your apple with its skin on, as the skin holds a significant amount of the fruit's fiber. A 3-inch diameter apple has 4.4 grams of fiber when unpeeled, but peeling the apple reduces the fruit's fiber content to 2.1 grams. The fiber in an apple is made up of soluble and insoluble fiber, both of which play a role in relieving constipation and allowing you to have a healthy bowel movement. 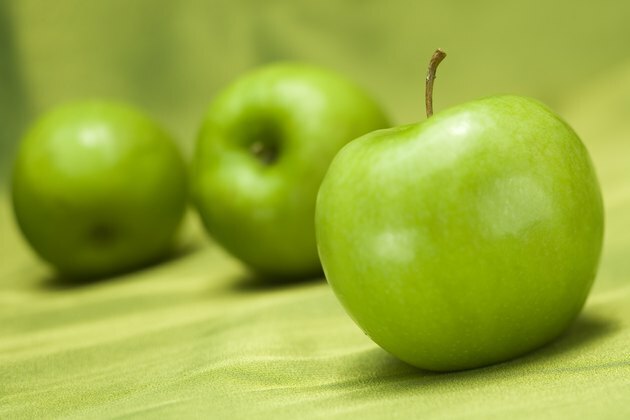 Apples have about 64 percent insoluble fiber and 36 percent soluble fiber. Soluble fiber develops a gel consistency in your body, which helps digestion by slowing it down. Insoluble fiber, meanwhile, enhances the bulk of your stool to help it move through your digestive system. Eating an apple might not immediately relieve constipation, but you can improve the situation by taking other easy steps. Ensure you're properly hydrated by drinking several glasses of water per day, and engage in a regular form of exercise, such as walking. A tip to avoid future instances of constipation is to take the time to have a bowel movement when you have the urge, rather than holding it.